My very first fiddle lesson! On Saturday I had the great pleasure of visiting Lisa Ornstein for my very first lesson on the fiddle. And to my amused surprise, I didn’t play a single note on the instrument. Yet I had a couple of hours of deeply satisfying conversation and instruction! So what did I do if I didn’t actually play anything? A lot of exactly why I wanted to engage an experienced teacher: i.e., a lot of going over the overall anatomy of the instrument and the bow, to talk about what goes into making them and how they work. And a lot discussion of proper stance, both sitting and standing, and proper ways to hold both the instrument and the bow. 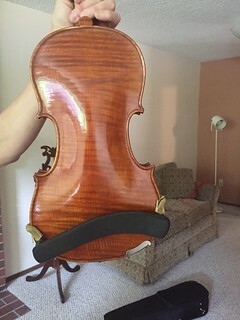 I very much wanted to sit down with someone who knew what they were doing to go over this stuff, just because the violin does intimidate me a bit, and taking the time to examine it in detail helps address that problem. If I know something, it becomes less scary! And as part of trying to make all that discussion stick in my brain, I’m writing it up now for all of you! There will also be pictures! So first and foremost, Lisa walked me through the various parts of the violin. Some of these things I knew about already, either from having encountered them in previous looking stuff up and/or hearing violin players talking about them, or else knowing about similar parts on guitars or mandolins. Strings, pegs, fingerboard, and bridge were all familiar for those various reasons. And as I write this post, I’m thinking I’d already heard about f-holes before, probably in the context of mandolins. What I did not know was what to call the very top of the neck: i.e, the scroll, which is purely decorative. 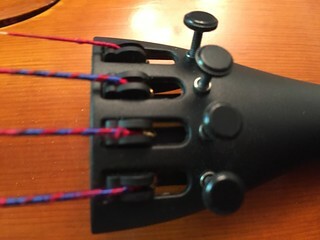 I also did not know about the heel, which is the part where the neck joins up with the main body of the instrument, which is totally non-intuitive! I mean honestly, your heel is not where your neck joins your body, right? And your heels are not, in particular, above your ribs (the sides of the violin body) and your waist (the parts of the violin body that are curved inward to the f-holes) and your back (which should be self-explanatory). The particular violin I’ve rented has fine tuners in addition to the main pegs. 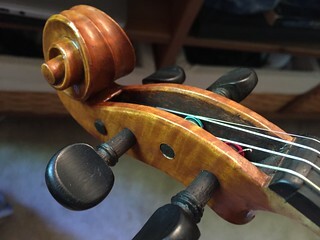 We talked about those too, and some about what you’re typically going to do when tuning a violin–though I do not know yet when a fine tuner will be useful vs. when I would want to use the pegs. I am expecting that this will be very much a function of this particular instrument, and I’ll know more as I start actually doing it and learning the various little individual quirks of how this instrument behaves. (I also am not sure yet whether it is “fine tuner” or “fine-tuner”. Google is not helpful in this regard, as searches are finding me references all over the place with both spellings. String players who follow me, chime in: what spelling is appropriate in your experience? For the time being I will be using “fine tuner”. Clearly there will be a lot of parenthetical asides in this post. Also, for reference, this instrument has fine tuners on all four strings. I’m given to understand that some instruments only have them on the E, and a bit of quick searching on the topic suggests that this may be a function of quality of instrument construction and/or what kind of strings you’re dealing with. Also seeing indications that fine tuners on all four strings are common on student-grade instruments, which is definitely what I have. The tailpiece, I learned, is what you call the bit that has the fine tuners. And it comes down to hook onto the button, which was amusing to me just because the analogous part I have on the guitars is the button where I hook shoulder straps. So in this case, similar-looking part, but different function. And we talked about the woods that typically go into the making of a violin, too: spruce, maple, and ebony or ebony-like material. My fingerboard is probably not ebony, just because, again, student-grade instrument. But spruce on the top and maple for the neck and the bridge. And I’m pretty sure I never quite grasped that maple was used for instruments! I’m so used to thinking of maple as the source for syrup. It rather pleases me to think of a maple tree as doing both. There’s some poetry there. And possibly a plot bunny. I took quite a few pictures of this instrument, some of which are used just above in this post, and you can find the rest of them on my Flickr account here. Likewise, we spent a lot of time talking about the structure of the bow. The notable thing there for me was learning that the end bit where you put your bowing hand is called the frog. On the bow that’s come with my student fiddle, there are decorative bits as well (some mother-of-pearl, a bit of leather, and a bit of colored winding that reminds me of the colored cords that Dara and I have used for accents on flutes we’ve made in the past). But the most interesting part of the bow, for me, turned out to be the stick. I had not realized before that there’s a hexagonal shape there. And I learned a new word: camber. Which is the word for the slight curve of the stick, and which is apparently created by carefully putting the wood through a flame! Which is a concept that rather wows me. According to the Wikipedia page for bows, the flame is an alcohol flame, and the bow maker does it a few inches at a time. It sounds like a very careful process, and fits rather nicely with that comparison I heard once of violin bows and wands in the Harry Potter universe. Because it’s just that level of crafting. I’ve written before about how, when playing guitar, there’s this sort of zen state I need to get into in order to play and sing at the same time. Specifically, that I have to not think too hard about what I’m doing, if I want my left hand, my right hand, and my voice to work together to make a song. So when Lisa started talking about avoiding having your muscles tense up too much while you’re trying to play, this sounded really familiar. In fact, it sounded a lot like how I totally get what Dara and I have called Angry Guitar Face: i.e., unconsciously scowling when I’m playing the guitar, especially if it’s a song I don’t know as well. I’ve seen this happen to other guitarists in performances as well, e.g., Simon Beaudry of Le Vent du Nord. With that in mind, we talked a good deal about sitting straight yet comfortably in the chair, with the feet flat on the floor. Lisa had me practice holding the bow as well, in the left hand, and then adding the right in such a way as to get me familiar with the proper feel of how to orient the bow hand. Because yeah, this is all about the muscle memory, and it’s specifically muscle memory that isn’t familiar to me from playing flutes or guitar. And we went through several ways to get your bow hand into the proper shape for holding the frog end of the bow as well–which amused me, as it reminded me of the “don’t crush the bird!” advice that I got from Stephanie at the Andre Brunet workshop in February! This was, unsurprisingly, rather delicate practice. Lisa had me settle my right hand on the bow and wiggle my fingers in certain ways, in order, just to get an idea of what the various ligaments in my hand do. My brain, meanwhile, kept looking for ways to tie this in to other instruments I know. And once I got down where my thumb was supposed to go on the bow, it was intriguing to me that I’ll need to think about that thumb’s positioning. I don’t have to care about my right thumb when playing a flute–in fact, that’s about the only one of my fingers I don’t have to care about on a flute, because whether the flute is keyless or keyed, that thumb is used only to support the instrument. On a fiddle bow, arguably it is still also being used for support, but there’s a big difference here since the bow in general is going to be responsible for making the noises on the instrument. And newbie though I am, I get that there’s a huge amount of nuance that you can get out of a fiddle. Having your hand positioned correctly does seem to me to be critical for that. And this also sets off potential intriguing applications for writing about magic, too. 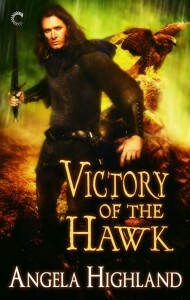 There are a lot of fantasy novels, urban or otherwise, that rely upon hand gestures as the means for delivering magic. Arrange your hand a certain way, and magic happens. That whole “don’t crush the bird” thing in particular sounds like a magical practice exercise! After practicing holding the bow, we also practiced holding the instrument. This involved standing up, holding the fiddle out in front of me, and sliding it into rest position on my right arm a few times. Then I held it out to my side and brought it forward to about halfway between “side” and “front”, and then turned it around to bring it to my shoulder, being careful to let my elbow naturally bend as well. Doing this helped us settle one thing very clearly: I’m going to need a shoulder rest. All hail my pal Dejah who had in fact loaned me one; I’m going to have to get one like it, now! The particular rest I’d borrowed from Dejah is a Kun, with a nice ergonomic curve to it that let it settle very comfortably along the slop of my shoulder. Then, once I turned my head a little to get my chin to the chin rest, I was able to do something I’ve seen fiddle players do before and which always made me go EEP: hold the instrument right there without needing to use my hands. Which was awesome. Certainly, so far I seem to be built pretty well to hold it, and learning about that was very reassuring given my earlier fear about it being uncomfortable. Turns out that the full-sized fiddle is fine, and I was in fact previously just holding it wrong. This? This right here? This is why I wanted to engage an experienced teacher to help me out. After we spent a lot of time focusing on the instrument and the bow, I also chatted with Lisa about ways I can up my game on trying to learn things by ear. Which was also very, very gratifying. I have some interesting new ways I can try to think about the tunes I already know: walking myself through how each of them start, what intervals between notes and what arpeggios happen, and about their overall structures. I’ll be working on this. And I’ll also be working on practicing just holding the instrument and the bow. Because yeah, this is all about the muscle memory. And it’s fun to think about not only as a shiny brand new baby fiddle player, but also as an author who has a fiddle player for a protagonist–and who is also learning magic. Quebec band recommendations, round 2: Genticorum! Great Atlantic Canadian Adventure is GO!